Visiting a local wine shop my wife and I were “hunting” the shelves in search of various bargains. It was Monday and there were three suppliers in the store restocking shelves. Okay, so I’m a Grenache fan anyway and we put it in our cart. It is from Navarra Spain and pours with a purple/cranberry hue with a big dried cherry bouquet. In the mouth this wine is really full and robust, not like any Grenache I am used to. It had chewy tannins with a hint of toast and full of stiff dried red fruit—very bold and underneath the first taste was a layer of candy; interesting and unique for this grape. I made the season’s first batch of venison chili which was a good pairing for this wine; it needed something equally bold to stand up to it. The wine was under $10 and the supplier was right; we liked it. Lesson here is that when a human being walks up to you and says, “Try this!” He is essentially putting his name, and very person on the line. He’s not just trying to sell you something; he’s excited about it and wants to share it with you so my advice is, put it in your cart and give it a whirl. Chances are high that you won’t be disappointed in raising a glass! Palate: Zippy candied strawberry - cherry with a stable but not complex structure. Finish: more light fruit and the slightest hints of oak spice that provide some non-fruit character to the finish. This lists at $20 a bottle at a local wine bar which means that it probably retails for 8-10 in your local store. (Today is half priced bottle Monday, so, we'll see what the resulting price is later). All in all this is an easy-going fruity wine. 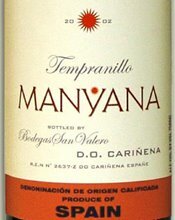 It is not as complex as some other spanish tempranillos (Tempranillo is the varietal pronounced "Temp-rah-KNEE-yo") but very drinkable. The light fruit nose and flavors will go with many dishes but could be over-powered by full-flavored savory meals. This Vin De Pays D’oc from the Southern France area where so many wine values are originating is a beautiful light kool-aidish cherry red with an ever so gentle sweet, strawberry,-cherry bouquet that is so fruity it’s nice just to smell. In the mouth this wine has loads of character with a first impression of a touch of licorice and fruit. It is fairly gentle all the way around but enough fruit and body to carry the day. This is a great wine to chill down and have on the porch, patio or deck as the remnants summer sun settles on the horizon. Nothing fancy, but quaffing pleasure. $9 takes the bottle home so raise a glass! This Sicilian which my wife picked out is made from the wonderful Nero D’Avola grape pours cherry red with a hint of purple. The bouquet is very light and the nose stingy at best. The palate is chewy and tight but it has promise. Breathe it! With room to breath it has pronounced cherry flavors and dried cherry notes. Tannins are bold but is great with a sturdy main dish. We had charcoal grilled Porterhouse and it was very nice. Not a lot of complexity here but solid rigid fruit that stands fast. Raise a glass but tell the truth! Previously reviewed and recommended this pale straw bargain, value wine at a price point of $6 is loaded with peaches, green apples and citrus in the nose with a sweet bouquet. In the mouth this wine is off dry–meaning it makes you believe it is sweet but it isn’t. It has decent structure, full of flavor and fruit with a nice acid base. As the wine warms a note of vanilla emerges which just makes it that much more wonderful. What a great value wine. I have bought this wine for as little as $4.29 and as much as $6.50. No matter it is a bargain! Raise a glass! This is the first Aussie port I have had. In the glass it is not the color I would have expected being more ruby than tawny. But the color is tinged with a hint of amber at the rim giving a cola sort of hue. The nose if full of stewed prunes and raisins with a touch of root beer. Interesting. In the mouth this wine is thick with a nice mouth feel if a little too heavy. It is sweet of course and a bit “flabby.” (Flabby is a common description of a wine, especially a sweet wine with insufficient acid in the structure. After a couple days of sitting with a vacuum stopper, I poured another glass. The bouquet was enticing and just kept smelling it over and over trying to identify the variety of aromas present. Caramel? Chocolate? licorice? I am liking this more and more. For the $10 I paid for it, it is a bit unusual, tasty and not bad! Give it a try and raise a glass. The folks a Chateau Julien have arranged a rather well designed Merlot challenge between their wine and the Blackstone Merlot. They've reached out to wine bloggers like The Wine Cask blog to accept the challenge and post the results. This challenge had a particular arrangement of flights to be set up by someone other than the participants. Of course, the wines would be tasted blind. To read about flight set-up, please read the entry below by PB. He's described this in detail in his entry titled "The Great Chateau Julien 'Merlot Challenge.'" I really enjoyed this exercise. As the folks at Chateau Julien expected, tasting a dozen wines arranged into three flights can exhaust the palate. They warned against palate fatigue and how the tasting gets progressively more difficult. However, after careful examination, I selected my favorite wine from each flight as requested and my selections were consistent throughout the tasting. My selections were B, B, A, in flights 1, 2, and 3, respectively. Flight 3, Glass C was also the same wine. In every flight, I identified the wines correctly and consistently chose the same wine as my favorite. Thankfully! This actually wasn't that difficult. The wine I consistently chose had a unique nose, a richer fruit core, and a better finish. I also knew right away this had to be the challenger- Chateau Julien. Why would they issue the challenge if they were the "average and typical" Merlot I tasted in the other glasses? I preferred the Chateau Julien from every flight because it was darker, richer, more unique, and more layered. It has so much more potential than the Blackstone! The problem is, I didn't really like it that much because of an odd, plastic note I've described in more detail in my tasting notes below. This odd layer was consistently present and detracted from my overall enjoyment of the wine. After completing the challenge and later comparing notes with PB of this blog, I realized the taste I was describing as plastic he was describing as daffodil. In any case, it was a detractor. So much so, for PB, that he picked the Blackstone in every flight. For me, though, the Blackstone was just too average. It tasted like a wine I would try not to buy. Why would I when there's so much interesting red wine from all over the world to choose from instead? Upon further comparing notes, PB and I learned two things: there are always objective things that make a wine good and there are always subjective things that make a wine enjoyable. We agreed on the objective qualities of the two wines, but disagreed on which wine tasted better. Thanks to the folks from Chateau Julien for their bold efforts to challenge a big Merlot producer in a blind tasting! In my mind, they win with a more unique interpretation of the grape! I didn't love their wine, but I think there's real potential in what they've got. I think this wine has a lot of potential because it's slightly dark, rich, and layered. However, I couldn't shake the odd plastic note. Without this, the wine would be really pleasant. I appreciate the fact that it's somewhat unique in its overall approach. The core of fruit is nice and dense, giving the wine class. Although the price wasn't disclosed, I assume it sells for $10-12. Again, it has a lot of potential as a classy and modestly-priced Merlot. Raise a glass! Sometimes a wine is just too typical. This is a very average bargain Merlot that has a round, fruity character and a moderately smooth texture. The problem is that it's exactly what you'd expect. While there's nothing offensive about it, there's nothing distinct or interesting either. On my first sip during the CJ Merlot Challenge, I knew this had to be the Blackstone. It was the first wine I tasted and quickly realized it couldn't be the challenger because it was too typical. What would be the point! Anyhow, it's an inexpensive wine I've seen priced from $9-12. I recommend you pass it up, though, and grab something more interesting. And raise a glass! This wine is little darker–better in color than the previously reviewed Blackstone Merlot. The bouquet of this wine though is what I describe as a bit green with a daffodil scent that I don’t like at all in red wines. There is some vanilla and even flowery aromas that is appealing but the palate is tannic–downright chewy--and a bit hot. I didn’t buy this wine so I don’t know the price but I suspect it is under $10. At any rate, for the money, you can find a much better Merlot like the Columbia Crest Two Vines or the 2003 Grand Estates at nearly the same price point. *This was the other wine in the Merlot Challenge–be sure to read all about it in the wine challenge entry below! This Merlot was sent to us by competitor Ch. Julien. It has a fairly light color for a Merlot with sweet blackberry fruit in the bouquet. In the mouth it is made in the slightly sweet (but it's not sweet) style with an average structure. All in all, typical inexpensive Merlot made to cater to the American palate. Don’t drink this as an example of Merlot; Merlot is much classier (and better) than this. I've seen the wine for under $9 but I’d pass it up for a similar priced Merlot-- but much better--from the folks at Columbia Crest. Raise a glass of that! *Be sure to read the entry about this wine and the Merlot Challenge! Increasingly wineries; shippers, producers and importers are tapping into the new generation of blog savvy customers. To that end, we at the Wine Cask blog (eighth ranked wine blog of the top 100 for 2006) periodically receive complementary bottles of wine for tasting and review on our blog. Patterning this challenge after the Pepsi-challenge of the soda world, the folks at Ch. Julien sent us a bottle of their 2003 Merlot and a bottle of their leading competitor Blackstone 2003 Merlot. I assume the price point for each of these Merlots is essentially the same which I would put in the under $10 category. (NW) and I happened to take the challenge together since he was up for the weekend. Here is the way the challenge was set up. We had 8 glasses set up in front of each of us in three flights. The first consisted of two glasses marked A and B, the second and third flights consisted of three glasses marked A,B, and C. My wife did the set up and pouring of wine. It was purely blind and (NW) and I could not see what each other was doing. The instruction for the challenge had us taste each flight and simply choose the wine we preferred from each flight. We took the challenge with perfect consistency as far as knowing which wines were the same wine in each flight and yet (NW) and I each had opposite conclusions as to which one we preferred. The set up of the challenge was unique and did a good job in validating the consistency–or lack thereof--in the tasters preference and ability to discern each wine’s attributes. The results? I chose Blackstone’s Merlot each time and also identified the one I preferred with 100% consistency across the challenge. In other words, in the two flights with three glasses of wine, two were Blackstone in one flight and two were Ch. Julien in the other flight. Interestingly, (NW) preferred the Ch.Julien and chose it with 100% consistency in the various flight. (NW) will be blogging his results as well–be sure to read his notes on the challenge! Here is what this shows: In the realm of objective tasting, (NW) and I had essentially the same review of the characteristics of each wine. But when it came to which wine we each preferred–the subjective aspect of wine tasting–I chose one, (NW) the other. Meaning, we taste wine the same but have different preferences in what we like. As I have written numerous times in this blog, there are objective elements to what makes a good wine, a “good wine,” but at the end of the day, it all comes down to what YOU like! What is also interesting is that (NW) and I both said, that while we preferred one wine over the other, neither Merlot was the type we would seek out. Kudos to the folks at Ch. Julien for their boldness in this type of testing and double kudos for realizing the power and economy of tapping into the world wide blogosphere! Daily we have people from just about every continent around the globe checking out what we have to say about wine. You just can’t afford to get that kind of coverage advertising! In the days to come, I hope to publish the results St. Julien derives from this unique endeavor. Raise a glass! The folks at Rosenblum specialize in Zinfandel with over 20 single vineyard designated wines. I have not had one that was not distinctive, superior and worth the price. This one was $24 and I bought on a trip to Los Angeles. This wine is rich in color and the bouquet out of the gate is wowing! It is sweet smelling and hints of bananas–I kid you not– with an almost bubble gum scent as well. In the mouth this wine is simply luxurious, and thick with deep currants, chocolate and great structure. I am overwhelmed with how velvety this wine feels. With breathing there is loads of ripe jammy fruit in the bouquet and a first time for me aroma of baby powder! I love it. In the mouth cocoa is prevalent with rich plush tannins. This is a bold and robust wine we served with grilled pizza. The finish is finessed and just all around wonderful. Raise a glass of something special! This inexpensive wine was less than $9 and is ruby, with tart dried red cherries in the bouquet and nose. But I have been swirling this wine for over 15 minutes for one reason or another and it is changing in the process of breathing it. It yields some wood with a really nice and unusual caraway note. The bouquet of this wine is clearly its best attribute as it is rather disappointing in the mouth. It is thin in style in both texture and flavor and a bit acidic with no finish what so ever. But I have been nursing this wine over the course of an hour or more and it is growing on me. As much as I was ready to not even drink but one glass of it, I kept going back to it. The biggest lesson here is to give red wines–even marginal wines a chance with plenty of air. Normally wines are opened and consumed and the best of the wine is missed as it is never allowed to come to the fore. So get in the habit of breathing all your red wines. Unless you’re opening a 100 year old bottle of Bordeaux you’re not likely to ruin it by giving it some time to open up. Sebastiani is one of the most reliable producers of American wine. This special bottling is made from Cabernet Sauvignon, Merlot and Zinfandel and is aged for 14 months in French Oak. The bouquet on opening is rather gentle with fresh cherries and berry fruit. In the mouth right before swallowing there’s a cocoa, vanilla and oak with dark berry flavors wonderfully balanced. With some breathing and a little warming up from cellar temperature this is pure blackberry juice with eucalyptus high lights. The feel of this wine is awesome, elegant and just really good. My beloved brought this wine back to me from a trip to California. It cost around $28 I believe. This is the kind of wine that spoils you! But spoil away and raise a glass. *Friends of (NW’s), after dissing us numerous times realized they had made us feel like a zero with the rim removed. We have been trying to get together with them with NW and others but they seem to always have something “come up.” Recently we were supposed to all pop some corks together but I guess the car needed an oil change, or they had to watch wall paper dry or some such thing. As a peace offering and self-esteem builder they sent this bottle up with (NW) for us to enjoy. This is New Zealand classic of pale straw color with a tantalizing green hint. The bouquet is brimming with what I call Guava paste, and grass. It is layered with citrus notes, fruit. In the mouth this wine is dazzling with a splendid foundation of acid with an excellent structure that highlights the tart citrus fruit flavors. It all just comes together with masterful precision. NW and bride were up for the weekend with added surprise of our LA daughter with our newest grandson. Special occasions mean the wine must flow! (NW) brought this treat with him. This Cachapoal Valley Chilean wine from the folks at Concha Y Toro is another one of their marvelous creations. On the pour it is a deep black cherry color that coats the glass. Bouquet is so lush with black cherry and blackberry fruit laced with a touch of mint, I want to get a fork to spear the whole berries. In the mouth it is full bodied with loads of dark heavy fruit and rich tannins, and cocoa powder. Breathe this wine for an hour or so. It has nice mouth feel and is just plain wine pleasure. (NW) paid $30 for this wine and even though Fred Franzia says no wine is worth more than $10, I’d raise a glass of this anytime! This is a good wine for $16 from Barossa Valley, Australia. It has layers and depth, with a sweetness of ripe fruit and spices. A couple of days earlier I enjoyed a Betts & Scholl Grenache also from the Barossa Valley. I was struck by how different Grenache can be from Shiraz in an area known for voluptuous Shiraz. My tasting notes for the Grenache are in the entry below and make a nice comparison between two red varietals from the same general location. This Shiraz is dark, rich, and smooth- the kind of wine that will stain your teeth as you nurse it in the glass all evening. Raise a glass! Friends provided this wine for the evening after returning with it from New York. This is a newer label from Australia that has been put together by two American wine aficionados. It's a classy wine, for sure, but you must be in the mood for a dry, austere wine. The herbal layers woven throughout are really nice, not green and harsh like some. I find it fascinating that the Barossa Valley can produce Grenache in this fashion given the ripe, juicy Shiraz the area is known for. This bottle cost $23. Raise a glass! Oregon Pinot Gris is an entirely different wine than the Italian Pinot Grigio that has become so popular in recent years. For example, this wine has some weight and depth to it that I normally do not associate with the Italian version. The Italian Pinot Grigios tend to be very light and crisp. Both styles are enjoyable and it is interesting to experience the differences. I had this at a restaurant and paid $8 for a glass. It paired well with the seafood and made the meal more enjoyable. Raise a glass! This Argentinean red is made from the Malbec grape that is coming into it’s own. It has a powerful bouquet of yeast and loads of dark berry fruit but on opening there is course layer of alcohol that is really distracting. With air, the berry rich bouquet remains with another tart berry aroma and flavor with an interesting layer of caraway. This wine was just O.K. The bouquet is the best part of this wine and I would just have to describe this bottle as a bit “odd.” Rule of thumb—if you have to spend a bit of time trying to decide whether you like the wine or not, you DON’T. I paid $8 for this bottle and there are numerous other Malbecs out there at this price point that you won’t have to wonder whether you want another glass or not. This one I’d pass up. But by ALL means, Raise a glass! This Spanish (Yecla) wine is made from the thick skinned Monastrell grape also known as Mourvedre (pronounced—More-ved) known for high alchohol content and hefty tannins. The Castano has been relegated to the refrigerator for cooking. Raise a glass—of something reliable! This South African Chenin (colloquially called “Steen”) is straw colored with nice full peach and guava bouquet and nose. It seems a bit alcoholy on serving but I served way too warm. After bringing to the right temperature the wine has decent structure with good acid making it pair with various foods adequately. In the mouth I would have guessed this to be a Sauvignon Blanc rather than a Chenin with it’s somewhat grassy tones and fruity palate. All in all it’s not a bad wine but nothing memorable either. I paid $10 for it so raise a glass. I found this to be an interesting wine, for sure, but not entirely enjoyable. I spent too much time trying to figure out what I was drinking and what I was tasting. Our friends were kind enough to supply this bottle, which was intending to be an experiment anyhow. They paid $13 for the wine. Ghemme is one of those tiny denominations in Italy that I rarely see stocked in wine shops. For that reason, it was fun to sample. This one certainly had some meaty layers to it, but it never really came together. I'll have to try another when I have a chance now that I have a reference point. Try something new and raise a glass! Hedges makes a CMS Red and a CMS White. I don't see the white around very often, so I grabbed a bottle for $12 in New York. Hedges is a Washington state winery and I like their wines, in general, as they seem to be consistently good. The letters in the name stand for Chardonnay, Marsanne, and Sauvignon Blanc, and they create a proprietary blend. This blend makes for a nice alternative white. The wine has good fruit, good acidity, and a nice texture in the mouth. Raise a glass! This wine is a complete mystery to me because every time the Wine Spectator reviews this wine of any of the past five or six vintages, they utterly trash it. So here goes my review and then I’ll copy in the Wine Spectator review for comparison. This wine is medium garnet on the pour with rich ripe black cherry, plum, currant and cola in the bouquet. The nose reveals a touch of spice and more of the same of what I found in the bouquet. In the mouth it is tasty, rich, and spicy with a tannic base though a tad bitter at the end. With a half hour of air there isn’t much change accept for a little cedar and more of the above. This wine would benefit from a few more years in the bottle. At any rate, my wife and I both enjoyed this wine paired with veal chops on the grill Tuscan style and the bottle was emptied—always a good sign. The Tapestry line costs $35-$45 routinely. This particular year was not worth the $38 I paid for it, but neither does it merit the pathetic 72 points the folks at WS gave it. I have two more bottles in my cellar; a 98 and a 99. I look forward to raising a glass of both! If you have tasted this wine—we would REALLY love to hear what you thought of it! The nose is quite subtle and very light in fruit. In the mouth, white pepper is the first sense you get and while it is light to medium bodied it is full of pepper flavors—again unlike any Gamay I have had. The finish is full of oakey smoke. With a half hour of breathing, the tannic bite loosens a bit and dried fruit comes to the front. This wine is rustic, a little rough around the edges but tasty and nice accompaniment to our grilled pork steaks. This wine was just $9 in Boston and clearly not my favorite Beaujolais Cru nor the typical Beaujolais Cru which tends more toward elegance. This one is more like a line backer than a place kicker but still part of the team! Raise a glass. There are better Chiantis in the world for $12. The 2004 vintage was a tough one, according to the industry, and this particular wine is probably better in other years. Take a pass. But raise a glass of something else! I'm enjoying this wine as I write. I can't remember the last time I had this- most likely about two years ago. When I saw it a few weeks ago for $8, I had to grab a bottle because I've seen it priced as high as $12. This is a well-made wine for the money, although nothing extraordinary. It has class, a touch of spice, and is dry and clean. Typically, the wine makers blend a variety of red wine grapes including the signature grape of South Africa- Pinotage. The playful label play-on-words gives it marketing appeal against the hokey value wines from Australia. The difference is that this wine is dry and crisp, placing it on the opposite end of the spectrum from the typical Australian animal label wines. When you want a really dry red wine that is widely available, this should do the trick. Raise a glass! This--my multitudinously reviewed wine which I adore--is unquestionably my favorite summer wine. So after three wonderful weeks of time off from my real life’s calling, I wanted to have a special dinner marking my last night of vacation. Little neck clams, and Mahogany clams steamed in a herbed, white wine and rose broth worked for the appetizers and Maine’s own unique contribution to the gastronomic world—lobster. I had opened the Gewurz as an aperitif to go with the appetizers but it was just so cotton pickin good I scrapped my intention to go with a Beaujolais Cru from “Morgon” for the main course and stick with the Fetzer right through dinner. I was a little apprehensive but fairly confident it would work. Ahhhhhhhhhhhhhh! This wine is sufficiently well made to handle the butter sauce of the lobster and the acidic sweetness is marvelous against the bitterness of the clams yet gentle enough for the sweet corn. Golden, apply nectar marks this wine with a bouquet to match it’s flavorful palate. Once again, this wine surprised me as being better than it should be in light of its price. I found it for $7.50 in Boston and bought ½ case. It sells for around $12 in most parts of the country from what I can tell. At any rate, dinner was a success, the wine fabulous and now back to the grind. Raise a glass! One of the glories of wine is not merely the objective qualities they display but the subjective memories and emotions they evoke. I will strive to be objective first–and then explain the rest. This 100% Sangiovese–the signature grape of Chianti wine--is a light ruby on the pour with a very nice bouquet of light cherry/black cherry aromas with a nose of pure fruit. In the mouth this wine is at first “salty” tasting with robust flavors of white and black pepper with solid tannins that have a tight grip on the structure. This wine needs serious air. I decanted it and after an hour or so, everything balances out nicely with smoke and oak notes with newly exposed, dried cherry flavors. It has the signature steeliness characteristic of the Sangiovese grape. It finishes short with wood and fruit. Feeling ambitious, I made home made tortellini, stuffed with our fresh garden grown, basil and Parmesan cheese. It was labor intensive feat but was marvelous. I topped it with a homemade marinara sauce and home grown squash, and locally grown sweet corn. I paid $15 for this wine in Boston and grabbed it immediately since (NW) and I–with wives at our sides–stayed at Vignamaggio on a visit to Tuscany a couple years back. It is the birth home of Mona Lisa and a beautiful estate situated amongst the hills of grape and olive farms of the winery. These grapes are grown right on the premises where we slept, ate and experienced sheer, Italian delight. In our 6 speed BMW, we toured all over the Tuscan country side and this wine evokes the bliss of that European fantasy. Venice was spectacular, Florence beyond words and this wine transports me back to hill top restaurants, hotels and gondoliers proudly boasting of their trade. Ah, Venice! Ah, Vignamaggio! The heck with objectivity; in light of it all, this wine is fabulous. Where else can you experience such reverie for $15? Raise a glass! I grabbed this on the sheer mention of the region of France–the “Minervois.” These wines are fruity, fragrant, balanced and adjusted for modern palates. It is a young purple on the pour with a medium black cherry nose. The palate is peppery and while it smells like Grenache it tastes like Syrah. With a few minutes of air, the flavors release a bit. This is a well made, balanced wine but it just doesn’t trip my trigger (or my wife’s). The wine Spectator gave this wine 90 points which is overblown by far. This is a good solid wine but 85-86 is max. Raise a glass! Purchased by the Scottish Murray family, this rose wine is 40% Grenache, 30% Syrah, and 30% Cinsault. It is from the heart of Provence (Southern France) and is lighter with a nearly salmon hue. The bouquet is gentle of pineapple, citrus, and is lively on the tongue nearly dancing. It is very tasty, fresh with good acidity and a brief finish. This is another swell rose from the Varois en provence! Raise a glass! This wine is dark and rich in the glass with a cherry rim. Deep plum and black cherry flavors fill the swirl with a little anise in the nose. There is a wonderful cinnamon taste in the front and a blast of spice in the rear. Right out of the gate this wine is elegant and delightful with rich ripe fruit made in artisanal form, it is luscious and spectacular. There is a huge cola aroma that emerges with a few minutes of air. This is the kind of wine you almost weep over when its gone. The Wine Spectator gave it 92 points. It is all that and perhaps more. Yes it was a bit pricey; I paid $40 in Boston and took it out to “billy’s” in Minneapolis. I highly recommend this wine–save your pennies and splurge–you deserve it; now raise a glass! I am still on my quest to find a good rose–no longer an oxymoron! I have found several out of the last eight I have purchased. This one, from the Cotes De Provence is very light in the glass, almost pink but it is freshly bursting with summer fruit. It has a nose that is sweet but the wine is not! It is quite dry and nicely acidic making it pair well with a lot of foods. In the mouth it is juicy and plump being made of 35% Grenache, 25% Syrah, 20% Cinsault (pronounced Cin-So) 10% Cabernet Sauvignon, 5% Mourvedre and 5% “other grapes.” It tastes like Grenache with its fruitiness and simple quaffing pleasantness. This wine paired well with grilled salmon with lime butter cutting through the fatty fleshy Salmon and cleansing the palate for the next bite. This was a $9 bottle and was just plain chilled, summer pleasure. Raise a glass. I spent about a week out in Minneapolis visiting three of my six grandchildren, my wonderful daughter-in-law and my son–“billy” of this blog. Wine of course figured heavily into the visit since I see my son so rarely. We had a great time playing golf and drinking some nice wine as well as participating in a wine tasting at the new Wine Styles shop in Chanhassen, Mn. “Wine Styles” is a relatively new franchise idea to market wine for the average consumer. The store’s wines are under $25 and arranged according to “style!” Big signs mark sections of wines sorted by their style--“Bold” “Sweet” “Crisp” “Fruity” etc. I walk in and ask the attendant behind the register if they sold newspapers in the store since I was looking for a Wall Street Journal. Understand there was NO ONE else in the store and he wasn’t doing anything but standing looking bored. His reply seemed like he was annoyed that I would trouble him with such a question. What he didn’t know was that I was there to shop for wine as well and since I was leaving for home, I was ready to spend some decent cash on three bottles to take with me; bottles that I can’t get in my part of the country; bottles that usually are fairly pricey. As I was glancing at their selection of white Burgundies ($45 and up) I realized I was annoyed at his response to my question about the newspaper and decided I didn’t need to spend my money at his store. I hope shop keepers who read this blog take this to heart; CUSTOMER SERVICE MATTERS TODAY!